Whether you need a venue for a boadroom style meeting for 8 delegates or a conference for 120 delegates Ramsdale Park is an ideal solution. Located in Calverton on the outskirts of Nottingham, we are easily accessible from the city centre and Mansfield via the A614 and B6383. There is also ample free parking for all your delegates. Our function room, the Course View Suite has recently been refurbished and is a light, spacious room overlooking the 18th green of the golf course. 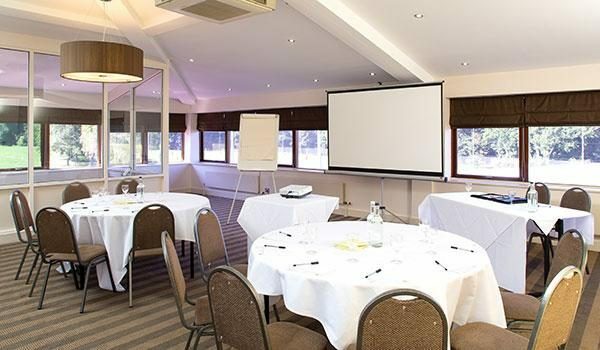 The room suits all traditional conference layouts and can be hired on a room hire basis, adding catering of your choice. Alternatively, we also offer an excellent value Day Delegate rate. The Course View Suite at Ramsdale Park provides the perfect setting for any event, with its high sloping ceilings, large windows and stunning panoramic views over the golf course. The Course View Suite is well suited to all meeting room layouts. Fantastic opportunity to meet like minded business people and grow your contacts! Our standard day delegate rate is great value for money. Call us today to book your meeting on 0115 9655 600. Why not add a round of golf, some time at the driving range, or even a group lesson for your delegates from one of our PGA Golf Professionals.